Isn't it strange for MacTarnahan's to come out with a beer called "Grifter" a couple months after Widmer came out with one called "Drifter"? I couldn't find a snifter for my Drifter and Grifter picture, so I photographed them in the pint glasses my brother-in-law gave me. 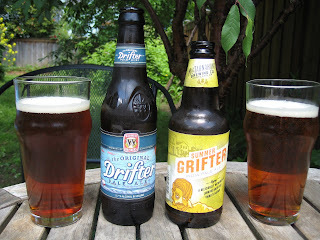 I'm a big Widmer booster, but Drifter Pale Ale is not going to be a regular for me. It starts off nice: a pretty copper-colored beer, with a beautiful -- really amazing -- smell. The smell is a combination of floral and citrus -- something like grapefruit peel and orange blossom. Unfortunately, it's downhill from there. The taste is a little bit of a letdown after the wonderful aroma. Still, it's not bad... at first. What bugs me is that the taste suffers as the beer warms up, which is not how good ale is supposed to be. By the time it gets to room temperature, the hop aromas and bitterness are all gone, and there's not enough heft to take up the slack. That's my opinion, but a lot of people seem to really like it. The reaction on Twitter has been mostly positive, on the excited side. The Beer Advocate average grade is B+, which I guess is pretty good. But most of my friends are as underwhelmed as I am. Charles said he's been adding the remnants of his six-pack to pots of beans as he cooks them. Over at Beervana, Jeff panned it very diplomatically, blaming the "catty" flavor of the Nelson hops used in the brew. I did like it a little better on tap than from a bottle, but that's not surprising. Final verdict: Drifter is not a terrible beer, but drink it cold. Maybe they should sell it in 7-ounce bottles. On the other hand, the curiously-named Grifter exceeds expectations. You won't switch from your favorite IPA, but give it a shot if it's served at a sporting event or you see it on sale -- I couldn't resist when I saw it for $7 a six-pack. It's a respectable Northwestern IPA: nicely hoppy and bitter with a decent body to back it up. And the flavor holds up as it warms. MacTarnahan's hasn't impressed me during my 6 years as a Portlander, so it's nice to see them come out with something solid. They're calling it a summer seasonal, but hopefully they'll make it a regular. I have a bottle in my fridge, so it will be interesting to see if I share your impressions. Also something from Redhook, which now eludes me. I find that my eye tends to pass over Pyramid/MacTarnahan's and Redhook products, as if my brain has already dismissed them. But in these matters, the nose and tongue have final say. We shall see. Drifter is much better on tap (at the Gasthaus where it's fresh, at least) than in the bottle (which may have been 3 months old by the time I got mine). It was significantly more flavorful (and less "catty") on tap, and did not get any worse as it warmed up… it's probably my favorite regular tap at the Gasthaus (though one of these days I'm going to have to try the hef), but then they have several rotations that I'd just as soon order. That's interesting. I really, really like the Drifter so I'm surprised you don't like it much. But I'll check out the Grifter for sure.